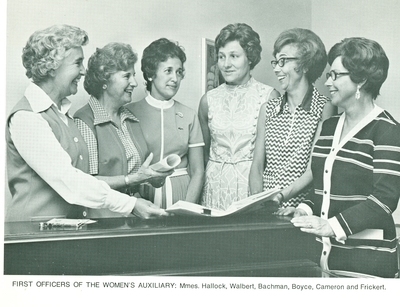 The Women's Auxiliary of the Hospital Center was organized when construction of the Allentown and Sacred Heart Hospital Center on Cedar Crest Boulevard began. Members of the Auxiliary have assisted the Hospital Center in a variety of ways. They gave slide presentations to inform community groups about progress during construction and also conducted group tours after the Center's completion. In addition, the Auxiliary raised funds with successful projects like "The Big Top Ball" and other programs. This photograph is found in a brochure that began to be circulated around September of 1976.